Yes. You read that title correctly. Breakfast meets creme brulee. Now that is a way to start the day! Not that it is an everyday breakfast but for a holiday morning or early morning entertaining, this is sure to impress. We have Jaden at Steamy Kitchen to thank for this naughty little taste of morning goodness. The original recipe has bananas which would be lovely but due to cyclones and floods, bananas are far too expensive for humble budget. Whilst I wouldn’t call this a quick breakfast, it only took me 20 minutes during which I had ample free hands time to set the table, make a pot of tea, fold a load of washing, hang a load of washing and do last night’s dishes (oh shut up, I was feeling lazy). *Good thick oats, not that quick cooking flaky muck! 1. Pulverise sugar for 10 seconds at speed 9. 2. Add egg and milk at cook at 90 degrees for 7 minutes on speed 4. 5. 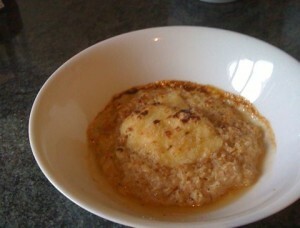 Put oats and milk in thermomix and cook for 9 minutes at 90 degrees on reverse speed 1. 6. Divide porridge between 4 bowls. Spoon 1 quarter of the custard in to the middle of each mound of porridge. 7. Sprinkle a little cinnamon over each bowl and scatter 2 tablespoons of brown sugar across the top of each bowl. 8. Grill (broil) or use your blow torch to melt sugar until browned. You did mean for step 3- remove custard from thermomix and place in a bowl- didn’t you. Thanks for the recipe. I’m having trouble with my porridge attempts. This is a winner! Made this for a lazy Saturday morning family day, it was gobbled up and spoonfuls pinched from neighboring bowls! Thanks for the recipe! !